Artemiy Artemiev - "Time, Desert And A Sound"
From the opening moments of Artemiy Artemiev's latest effort, the images of arid desert and stifling heat are brought to life, though Artemiy does so within the context of a larger spacey Middle Eastern influenced landscape. 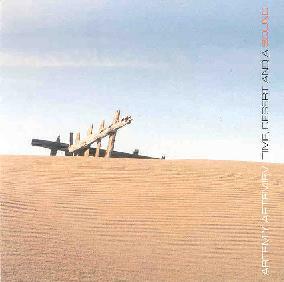 The front cover depicts a broken down fence in the desert and on the back we see a lone camel. But as I closed my eyes I envisioned a stream of Bedouin nomads traversing the desert, while a harmonica melody blurs the image with its sensation of American cowboys sitting around an evening campfire. And enveloping all of this is a huge wall of droning ambient sound that defines Artemiy's electro-acoustic focus as didgeridoo sounds and flute blend with the electronics. "Time" continues the theme of dusty isolation but with a looming alien presence. The ambient waves and swirls are so powerful it's like a massive mothership is hovering mere feet above our heads. And sure enough... before I know it I'm abducted and goodbye Earth! Single note bass lines rumble through my brain, giving a mule kick that shatters my senses. The attention to sonic detail on this album is stunning and only 2 tracks in I'm thinking this may be one of Artemiy's finest works to date. "Desert" is a collaboration between Artemiy and Valery Siver who contributes acoustic guitar and guitar synth. The track begins in a more peacefully melodic and uplifting mode, though it soon shifts toward the gripping, ominous feel of the previous pieces. In fact, things get even more high volume and intense as Artemiy adds chaotic clattering sounds and explosions, blending avant-garde experimental bits with rushing ambient waves and Siver's guitar melodies. I love the contrasts. "A Sound" is a nearly 17 minute combination of meditative mantra chants (voice courtesy of Miroslaw Rajkowsky) and drones, plus additional layers of ambient and alien sounds and percussion. Artemiy excels at bringing together multiple contrasting elements into a seamlessly cooperative whole. Finally, "Mysticism Of Sound" is a 36 minute epic track recorded by Artemiy and Valery Siver during the summer 2003 Europen-Siberian concert tour. Siver's guitar work fits so nicely with Artemiy's high intensity earthquake sonics and sound-art pandemonium. But in contrast to the melodic acoustic guitar on "Desert", Siver plays in a spacey avant-garde free-improv style, and we even hear bits of trippy Blues. The piece builds steadily though the intensity level is high right out of the starting gate. Percussion is heavier on this piece than the rest of the CD and only adds to the power of music. In summary, this is a powerful album with lots of creative variety and a sense of pure passion that will keep the listener intrigued and attentive throughout. Definitely a highlight among Artemiy's many releases. CLICK HERE to see a list of world wide Electroshock distributors.